SKF is introducing new modelling and simulation techniques that enable software tools to be used more as a method of analysis than as a method of calculation. 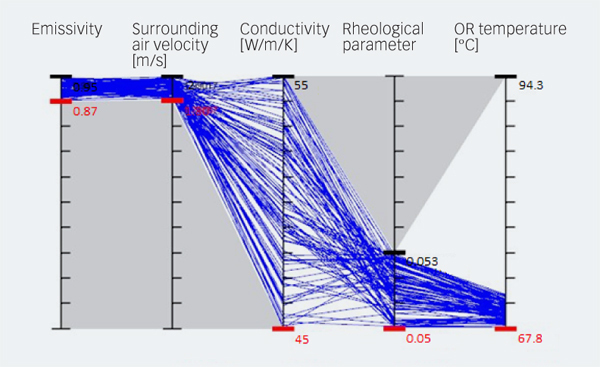 With this development SKF engineers can more easily carry out analyses to explore in a much wider design space for a particular customer application, involving multiple factors in varying operating conditions. SKF is introducing the next generation of modelling and simulation techniques for analyzing bearing components and systems in customer applications. 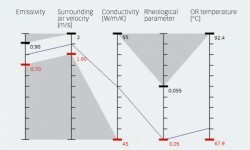 These powerful and easy-to-use techniques have been developed to help SKF application engineers carry out more sophisticated analysis tasks that will reap benefits in customer applications by identifying the optimal solution. SKF has long experience with simulation tools. These tools are constantly being developed, and new functionality and capabilities are added to simulate all major components – bearings, shafts, seals, gears and housings – as a complete system in models that are closer to reality. Today, SKF widely uses software tools in application engineering activities to study customers’ applications in specific operating conditions. The recent developments in modelling and simulation are aimed at meeting major challenges, especially in regard to changing customer trends and requirements. Firstly, there is increasing demand to evaluate more than one design option for a given application. 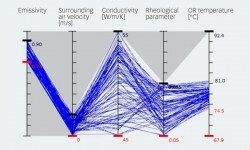 This adds to the complexity of the simulation task. For example, for a bearing system for a wind turbine, SKF came up with several design proposals before narrowing the selection to only a few alternatives for the customer to consider. By using the new techniques implemented in SKF tools, hundreds of simulations can be carried out on these proposed bearing solutions to identify the best fit for the customer’s application. Secondly, there is the issue of robustness and sensitivity. 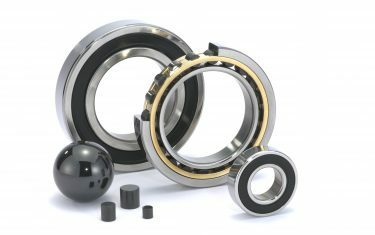 This relates to how bearings and other components live up to the real conditions in an application, which may differ considerably from that of the design criteria. In some applications, customers want to know more about the performance of the proposed solution in varying operating conditions. If a few variables have huge value ranges because they are difficult to control, how much will the performance of the bearing be influenced? To make sure that a bearing works in a stable status in the customer machine, it is important to know which operating condition needs to be controlled with the least variation. 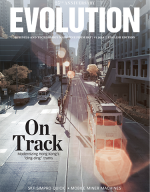 The third issue relates to modelling more than one variable simultaneously. 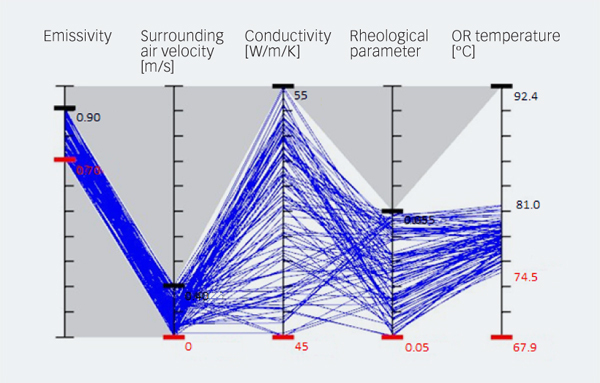 Even though it is quite common to involve many factors as variables in modelling and simulation, it is not easy to analyze the combined effect of multiple factors at the same time. With a single variable, engineers can easily arrange a few simulations between the minimum and the maximum values in the range and then plot a nice curve after executing them. When there are three or four factors involved, there are two main difficulties. One difficulty lies in design of simulations, the other in analyzing the calculation results, or at least the results visualization. One way to overcome this is to vary one parameter at a time with all other parameters fixed, and then, after executing designed simulations, to vary other factors one by one. In this way, engineers can obtain information about the system running under certain specific conditions, which is better than nothing. However, they might still miss the overview of the system performance, especially related to the combined effect of all these factors. The latest generation of SKF’s in-house modelling and simulation tools are designed to face these trends and to make the tools easier for engineers to use by, for example, being able to vary parameters and carry out a number of simulations more easily. An important feature of the new generation of software providing this understanding is that Six Sigma methodology has been integrated into SKF’s modelling and simulation tools. Six Sigma has been successfully applied in manufacturing to identify and remove the causes of defects and has been used in other engineering and business areas to improve quality and increase customer satisfaction. 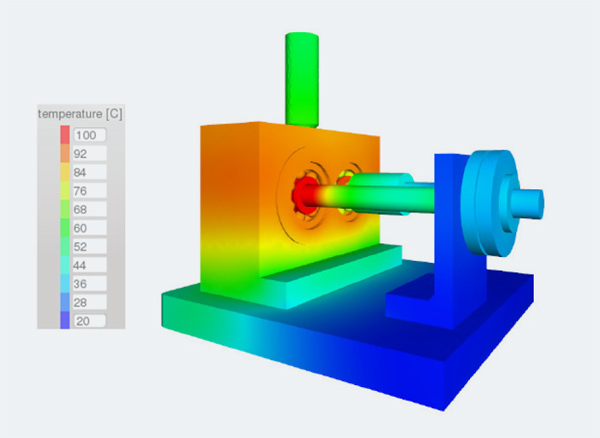 At the heart is a toolbox to support many engineering tasks such as simulation design, sensitivity studies, robustness analysis and optimization of results. 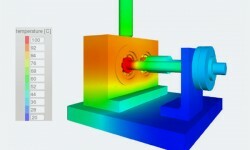 Such tools are equally important in modelling and simulation. At SKF, these functions are supplied in the next generation modelling and simulation tools. They can be accessed by a very clean and simple interactive graphical user interface, with all the complexity about mathematics and other Six Sigma elements hidden behind the screen. Also, the new software tools present the results in a more intuitive, visual way. In practice, integrating Six Sigma methodology in this way makes life much easier for both SKF engineers and customers. 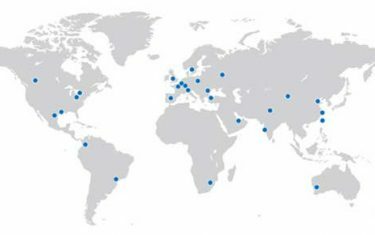 For SKF engineers, it means that more engineers can do those complex analyses that previously could only be carried out by people with special knowledge and experience. For customers, they are more likely to get several design options rather than a single choice. In addition, they can obtain more information about any single option, such as if that option is sensitive to an input fluctuation or whether this option is more robust than another option. Another benefit of the integration with Six Sigma tools is that users don’t need to design simulations in one tool, do hundreds of simulations in another tool and then do analysis in the third one. In the new software they are all integrated in one consistent software environment, through a clean and simple interactive graphical user interface that can be used after basic training. In one example for an industrial gearbox, the aim was to improve the overall system performance through controlling temperature generation. In addition to using the modelling software, a physical model was used. 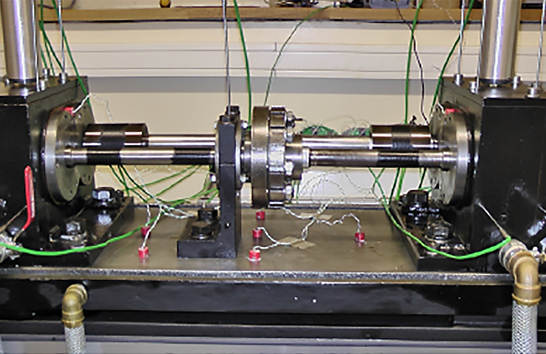 Testing was carried out on an FZG test rig that contained a back-to-back arrangement of two single stage spur gearboxes (fig.1). 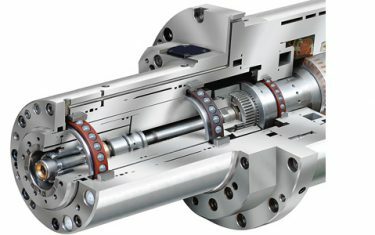 The shafts were supported by radial deep groove ball bearings. 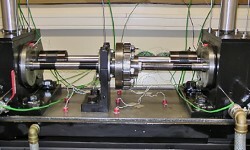 In this set-up the temperature of the outer ring location of the bearings is used to assess overall temperature development (fig. 2). 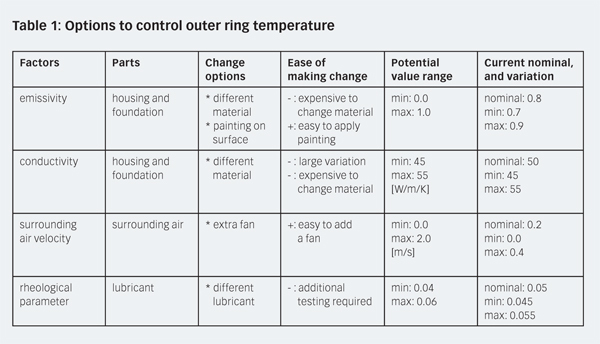 Four factors were identified to control the temperature of the outer ring as shown in Table 1. Each of these four factors – emissivity, conductivity, surrounding air velocity and rheological parameters – was then modelled to determine its influence on outer ring temperature. Fig. 3 shows the starting point for the simulation with the current known setting for the application in relation to outer ring temperature and the four factors displayed as a parallel coordinate chart. Following 100 simulations with varying inputs (fig. 4), the outer ring temperature shows wide results fluctuations. One important aspect of the new modelling and simulation tool is that engineers can run hundreds of simulations, in this case designed according to the Monte Carlo method. Using simple minimum and maximum sliders in the software graphical interface, it is possible to do filtering and analyze the effect of each individual factor. The theoretical optimal solution is shown in fig. 5, which is obtained by filtering and carrying out a series of new simulations. 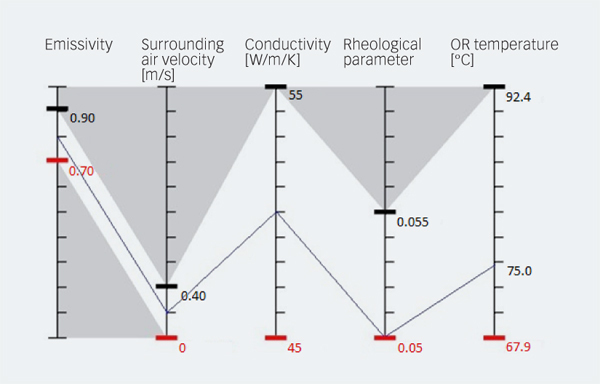 It becomes clear that in the case of emissivity there is not much opportunity to improve between the baseline and the optimal situation; for surrounding air velocity outer ring temperature is sensitive to this factor, and raising this value lowers the outer ring temperature, while for conductivity and rheological parameters there is little sensitivity to these factors. 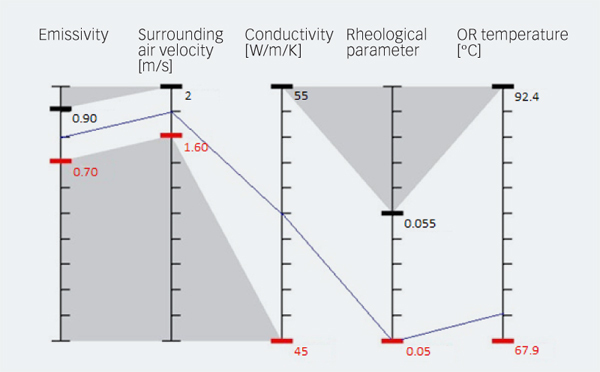 When the designed solution incorporating improved surrounding air velocity is modelled, the benefits of reduced outer ring temperature can be clearly seen (fig.6). 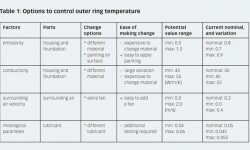 The simulation analysis confirmed that controlling the surrounding air velocity was the best solution to reduce the temperature of the bearing outer ring in this specific application. According to the simulations, the bearing outer ring temperature would decline from a range of 74 – 81 °C to one of 69 – 75 °C. For the customer, the practical outcome is that by the simple add­ition of a fan, considerable performance benefits are achieved. 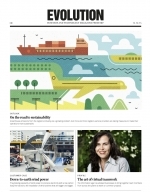 For SKF, it demonstrates the power and advantage that access to improved software and modelling tools can give to its customers. Increasingly, customers will be seeking a better understanding of the factors that influence the performance and life of their equipment design, and SKF is demonstrating that it has both the tools and the knowledge to provide that analysis and to offer better solutions.